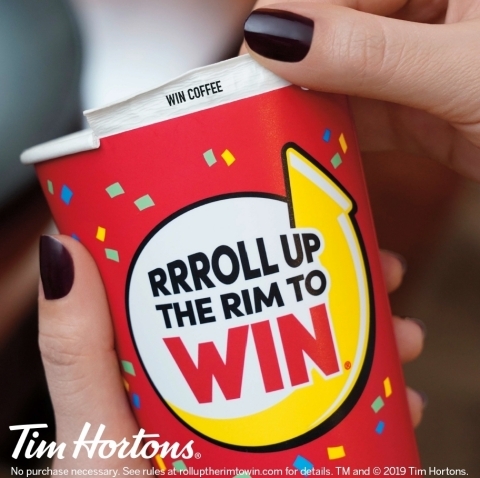 TORONTO--(BUSINESS WIRE)--Tim Hortons® U.S. legendary RRRoll Up The Rim To Win® sweepstakes is back today with over $4 million in prizes. * For the first time, Tim Hortons® and Jeep® are partnering to give away a Jeep® Compass Latitude 4X4. Guests also have a chance to win additional prizes, including $2,500 Prepaid cards and $50 Tim Cards®. It’s easy to play RRRoll Up The Rim To Win®. Simply purchase and enjoy a Tim Hortons® freshly brewed coffee, handcrafted espresso beverage, or hot chocolate in a medium, large, or extra-large. Once empty, roll up the cup rim to see if you’ve won. TIM HORTONS® is one of North America's largest restaurant chains operating in the quick service segment. Founded as a single location in Canada in 1964, TIM HORTONS® appeals to a broad range of consumer tastes, with a menu that includes premium coffee, hot and cold specialty drinks (including lattes, cappuccinos and espresso shots), specialty teas and fruit smoothies, fresh baked goods, grilled Panini and classic sandwiches, wraps, soups, prepared foods and other food products. TIM HORTONS® has more than 4,800 system wide restaurants located in Canada, the United States, and around the world. To learn more about the TIM HORTONS® brand, please visit the TIM HORTONS® brand website at www.timhortons.com or follow us on Facebook, Twitter and Instagram.